Keep the ball bouncing, go for the highest bounce, or hit the targets in this fast paced action game for iPhone. A new and unique maze game for iPhone. Touch and drag your way through 50 challenging mazes, which will reward patience and precise control. Frosty Pixel is an independent games studio, focusing on fun and original titles for iOS and Android devices and Flash/Actionscript games development. With almost ten years experience in the games industry, and a wealth of knowledge and experience in developing games and educational titles for the web and mobile devices, we can handle every stage of your games project, from concept to marketing. If you have an idea for a game, whether it's an original concept, or a port from another platform, we can handle the entire project including design, development, graphics and audio, quality control and testing, and final publication. We develop for the web (Flash), iPhone/iPad/iPod Touch and Android platforms. Give us a call today a for a friendly chat about your project, and a no nonsense, no obligation quote. 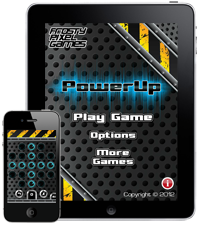 Copyright © 2012 Frosty Pixel Games - www.frostypixel.com - All Rights Reserved.